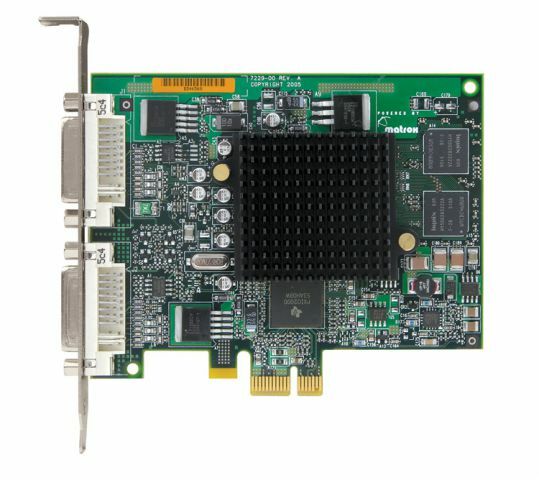 The Matrox G550 PCIe is a dual monitor PCI express graphics card with x1 performance and has Windows and open source display drivers for Linux along with other Unix-like operating systems. Support for Microsoft Windows 7 (XDDM), Windows Server 2003, Windows Server 2008, Windows Vista (XDDM), Windows XP, and Windows 2000. * Drivers for Windows 7 (XDDM), Windows Server 2003, Windows Server 2008, and Windows Vista (XDDM) available online. For other possible operating systems, contact Matrox. * G55-MDDE32 may also be available from resellers. For more information, see online Matrox RoHS information.